Salesperson wanted, must know how to manage Amazon and Ebay accounts as well as store sales. Bilingual english/spanish a must. Must be handy with tools to assembly bicycles and some repair. Drug test and background check. Please send resume, no phone calls please. Hmmm... "electric bicycle store North Beach Miami Beach Florida"... Gettin' harder to figure out who this is. We are a truly global company exporting 80% of our production to 45 countries around the world and intend to produce over 50,000 bikes this year. We can offer you a job you won't find anywhere else. Brompton wants to transform cities. By providing the means to commute or explore with a bike that you can take anywhere and store anywhere we can make cities better places to live in. Our high quality products, combined with resurgence in cycling, means that we are enjoying strong, sustained growth. If we are to continue to thrive we need to recruit great people who can contribute to our ambitious aims. We are a truly global company exporting 80% of our production to 45 countries around the world and intend to produce over 50,000 bikes this year; though we believe we’re just getting started. We can offer you a job you won’t find anywhere else. Employed by Brompton BV, this is a medior sales role in a region where further growth is required, and is a strategic focus for current and future investment – including the launch of Brompton Electric in 2018 and other exiting pipeline innovation, and the development of our flagship Brompton Junction retail format. This role covers Belgium, The Netherlands and Luxemburg – markets where Brompton has operated directly with its retail network for the last two years, since parting with its long-term Distributor of 20+ years. Reporting directly to the Benelux Sales Manager (based in the Netherlands & Dutch speaking), the role carries a significant degree of autonomy. You will work in a small energetic team with direct inside sales support from the UK to achieve your goals. You will take full responsibility for a part of the current Benelux Brompton retailer network (circa 50+ stores) and besides that you use everything within your ability to be entrepreneurial to create new business opportunities. As part of your role you are responsible for guiding events into the right direction together with the marketing department and sales manager. Your principal remit shall be to grow bikes sales across the region, without traditional selling tools such as volume/bundle discounts or rebates to hand; and smash through preconceived attitudes towards the folding bike in The Netherlands. Already sympathetic to Brompton Brand values, you will quickly grasp you are selling lifestyles, not just a bike. One of your greatest challenges will be to convey this to retail store staff around the region, individuals that are quite often a barrier to growth: ignorant to the joy and pleasure attached to owning a Brompton. The role requires an entrepreneurial self-assured personality that is strongly results focused, well organized, self-motivated and resourceful. You can work effectively and efficiently remotely. Brompton is looking for someone with 2-3 years of experience, preferably within the bicycle industry (bike sales or parts and accessories), that has a clear understanding of market developments, strategic competition, suppliers and retailers within. You have the talent to confront the rapidly changing marketplace; and identify correct routes to sustainable long-term success. Additionally, you will personable and resourceful. Fluent in English, Dutch and preferably French Hehe... Ooops. Brompton offers you a very excellent working environment with enthusiastic colleagues who get along very well, communicate and cooperate with each other. The working climate is informal, but we work hard. Next to good terms of employment Brompton offers you the opportunity to work in a responsible and challenging job within a dynamic, international and ambitious environment. We are all proud to be part of Brompton Bicycle; we all share the same passion and dedication to the company and embrace differences in cultural backgrounds and skills. If you feel that you fit within the Brompton team spirit and you can bring talent, innovation and enthusiasm to our workforce then please email your CV and covering letter to the People team, at recruitment@brompton.co.uk – the closing date for this position is: 25th January 2018 – You are encouraged to submit when ready and not wait until the deadline. They give you a car, not a bike. Seems sort of retarded, especially in the Netherlands. Hehe... Those Brits... The Dutch figured out decades ago that Cars=Bad... Could be that somebuddy in the UK needs to "wake up"... at least in writing job descriptions for jobs in the Benelux. We have received your application successfully and have informed the recruiter. BMEBIKES is looking to hire a part-time mechanic to build electric bicycles. The candidate must be good with his/her hands, and will be trained to build an electric bicycle from start to finish. Prior mechanical experience is required. Attention to detail is required. Interest in the bicycle industry is preferred. We basically want someone who is hard-working, and an all-around good person. Full Time - Hours: 8:00am -- 5:00pm, Monday -- Friday. Our ideal candidate is a self-starter who takes initiative to bring our inventory system to the next level. Minimum 2 years of bicycle mechanic experience. Do you have a passion for bicycles of all kinds and purposes? Do you enjoy helping people? Can you ride in the worst of Seattle weather with a smile? We are currently looking for a good person to add to our service and sales team. `Kay. Show of hands... Who is NOT connected with the "ebike industry" in Seattle? Center Valley is an unincorporated community (Census Class Code U6) one mile north of Coopersburg, Pennsylvania, at the intersection of Pennsylvania Route 309 and Pennsylvania Route 378 in Upper Saucon Township, Lehigh County, Pennsylvania in the United States. Lehigh County is a county located in the Lehigh Valley region of the U.S. state of Pennsylvania. As of the 2010 census, the population was 349,497. Its county seat is Allentown, the state's third largest city behind Philadelphia and Pittsburgh. I need help connecting the wires, securing and storing the electronic components (battery and controller) of my electric bicycle inside a toolbox, and attaching the wires on the bicycle frame. I have all of the materials, but none of the tools. I need this bike completed ASAP. Bodiam is a small village and civil parish in East Sussex, England, in the valley of the River Rother near to the villages of Sandhurst and Ewhurst Green. Bike mechanic / after sales technician. We have a vacancy for a Full Time Experienced after sales technician for our busy and rapidly growing electric bicycle operation working within our busy workshop In Bodiam, East Sussex. Whilst the position will be mainly desk based, mechanical skills will be very much required. We are one of the largest E-Bike stores in the country, and still Growing! Currently looking for both Sales staff personnel & a professional bike mechanic with 1+ years of bike shop experience. Full/part time considered. Above average compensation including a base plus commission and bonus Structure (based on experience/performance). Sales and E-bike experience would be excellent but not required. E-Bike training will be provided. Help build the best E-Bike company in the country? Come make your mark in the fastest growing segment and the future of the Bicycle industry! We are looking for an experienced bike mechanic to lead our service area and to take a leadership role in the growth of a well-established e-bike specialty shop. This is a great opportunity to expand your experience in the rapidly-growing electric bicycle industry. Along with leading our service team, expect extensive customer contact, especially on the sales floor. The ideal candidate will get “charged up” for delivering a great customer experience and getting more people out of their cars and onto bikes. We provide an environment that encourages innovation and the chance to put your ideas to work. Full time – 5 days per week. Year round is preferred. Hartford County is a county located in the north central part of the U.S. state of Connecticut. As of the 2010 census, the population was 894,014, making it the second-most populous county in Connecticut. Hartford County contains the city of Hartford, the state capital of Connecticut and the county's most populous city, with an estimated 123,243 residents in 2016. Simsbury is a town in Hartford County, Connecticut, United States. The population was 23,511 at the 2010 census. The town was incorporated as Connecticut's twenty-first town in May 1670. Simsbury was named the 4th best town in Connecticut on Connecticut Magazines list of top places to live 2013 and 9th best town to live in 2015 in the United States by Time magazine. Expanding bicycle shop expanding seeking experienced bicycle mechanics for our Simsbury location. Brand New Bicycle Shop opening in Sonoma. We are Blazing Saddles Bike Rentals & Tours and we are thrilled to be opening our newest location in Sonoma. We have been family owned and operated for over 30 years in the Bay Area and are looking forward to becoming a part of the Sonoma Valley community. We are excited to bring our exceptional customer service to our newest operation in Sonoma by being another great option for bike rentals and tours as well as sales and service for the local community. Bike Mechanic: Our relationship with Specialized Bikes has been going strong for years, and we look forward to continuing to offer their bikes, as well as a full selection of electric bikes , kids equipment and road/mountain bikes for sale and to service. Our rental bikes are going to get a lot of use, and will need general repair fairly regularly. Our rental fleet of bikes includes hybrids, high end road and mountain bikes, kids' bikes, tandems and electric bikes. We also have boat loads of brand new bikes arriving and we need help assembling them right out of the boxes. SEATTLE — Consumer-direct e-bike brand EVELO Electric Bicycles is recruiting brick-and-mortar dealers in select markets for its new Demo Dealer Program. For more than six years, EVELO has partnered with hundreds of bike shops across the U.S. to provide local service and repair. The company said the new Demo Dealer Program will enable EVELO to strengthen those relationships. Looking for a SALES MANAGER with advanced communication skills and some understandings of bicycles. Bondi Junction is an eastern suburb of Sydney, in the state of New South Wales, Australia. It is 6 kilometres east of the Sydney central business district and is part of the local government area of the Waverley. Bondi Beach is a neighbouring suburb to the east with a world-famous beach. Bondi and North Bondi are also neighbouring suburbs. We are looking for a Sales Ambassador to join the Interactions team for a roadshow in Charlottesville, VA. This event runs for 5 consecutive days where you will have the opportunity to sell a revolutionary electric bike that is designed to make life easier, smoother, and more efficient. If you are driven by sales and a bicycle enthusiast then this job is for you! Sales Ambassadors are provided with training prior to working their first event. On the top floor of the impressive Dominor building, our nine HR professionals work daily for you on recruitment, selection, assessments, and assist you with HR advice and practical support. If desired, consultants can also work at your location. Burger Support was founded in 2005 by Marcel Burger and Maaike Burger-Nienhuis. Giant Europe BV, located in Lelystad, The Netherlands, is looking for a Product Coördinator E-Bike Systems. Are you as crazy about bikes as we are? At Giant you will be able to work in our dedicated e-bike team together with our designers, marketing and engineers, and contribute to our ambition in making the best e-bikes in the world. Your work will assure our engineers know what will make our electric system commercially a winning system, while you assure its features get communicated with conviction through our marketing team. NYCeWheels is hiring a full-time Bicycle Mechanic for our Manhattan location. NYCeWheels is a specialty bike shop located right near the Queensboro bridge. Our main focus is on folding bikes and electric bikes. We've been in the industry for 17 years, being one of the early adopters of electric and folding bikes in the country. LOVE how "Ebike Folks" are now "skilled trades/artisans". We are looking for self-motivated people who want to be a part of something that will be super BIG - Bird! Our fun and efficient scooters can be rented anytime using the Bird App on iPhone and Android. Rides are $1 to start and 15 cents per minute. 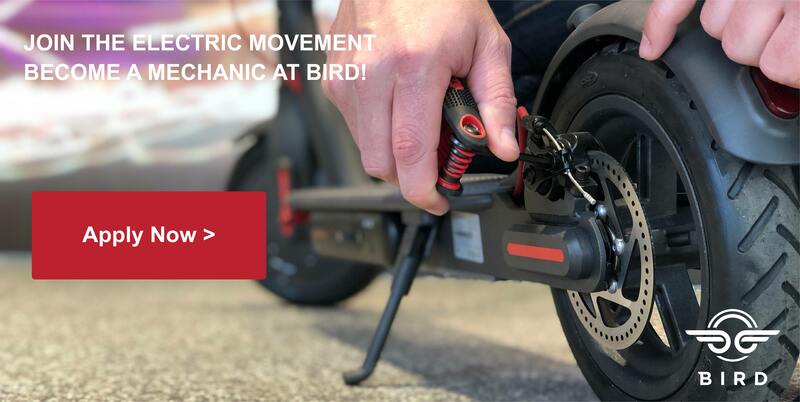 Bird electric scooters are available throughout Los Angeles and San Diego. They can be picked up and dropped off anywhere you like without a lock. It's magic, and we are coming to San Francisco!! We are looking for people who aren't afraid to get their hands dirty to help us maintain, repair, and distribute our electric scooters (Birds). This position is an instrumental role and is responsible for ensuring that our electric scooters are always in optimal condition for riders. The job will require you to locate a Bird (through our app) which is in need of maintenance, capture it, repair it and then release it back on the streets for use by our riders. Chessington is an area in the Royal Borough of Kingston upon Thames within Greater London. Historically part of Surrey, today it is the largest salient of Greater London into that county. Gocycle is expanding our customer pre and post-sales support team in preparation for an exciting 2018! Would you like to work for one of the most innovative electric bicycle brands around? This is your chance to join the Gocycle team and help us to make Gocycle the best electric bicycle in the world. We are a dynamic company with many opportunities available for the most qualified candidates. Madly growing and located in Ballard, we are seeking Bike Assemblers to join our team. If you are a person who likes to problem solve, work with bikes and plays well with others, check us out at www.radpowerbikes.com. This is an entry level position with for people who are bike enthusiasts/want to learn something new and be part of the Ebike industry. We will train.